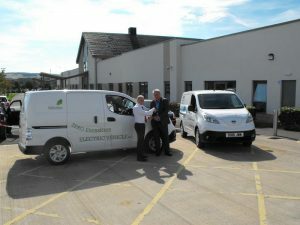 Midlothian Council in partnership with NHS Lothian have signed up to add three electric Nissan e-NV200 vans to their fleets. Supplied by local Nissan car dealership Alex F Noble & Son, the new vehicles are being leased with the help of the Scottish Government’s Low Carbon Vehicle Procurement Scheme. The council will use its new van for moving around council records and goods while NHS Lothian is using its two new vans for transporting records.